Free download Battlefield Play4Free game for PC. It, often abbreviated BFP4F, is a first-person shooter video game developed by EA Digital Illusions CE and Easy Studios and published by EA. Based on the Battlefield series, the game features a modern warfare battlefield setting. 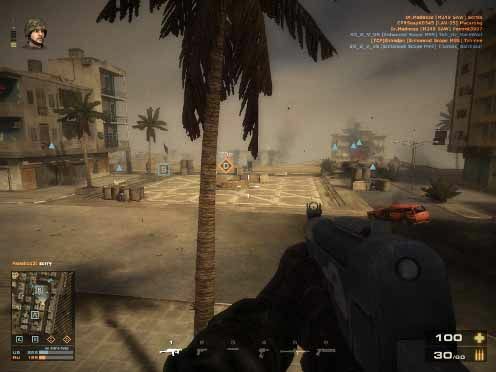 Play4Free is built on a modified version of Battlefield 2’s game engine, with improvements such as high resolution artwork and post-processing effects. The game is also less demanding on computer specifications, similar to Battlefield Heroes. As the game’s title suggests, the game is available to players for free online, under Electronic Arts’ “Play4Free” model. Play4Free uses a similar micro-transaction store system similar to that in Battlefield Heroes. Battlefield Play4Free was announced on November 5, 2010. The game’s open beta testing phase began on April 4. Closed beta codes originally started being distributed via email on November 30, 2010. The game was released on April 4, 2011. The game runs on a game client, and approximately 1.95GB of game data is downloaded to the hard drive. Battlefield Play4Free features content from both Battlefield 2 and Battlefield: Bad Company 2. Battlefield includes two gameplay modes, Assault and Rush. The game has a leveling system, in-game shop, and gameplay customization which is quite similar to that of Battlefield Heroes. Battlefield Play4Free currently features eight maps from Battlefield 2 and supports up to 32-player servers for online battles. Players are randomly chosen to play as soldiers from either the Russian Ground Forces or the United States Marine Corps. Battlefield Play4Free features a class system, which is similar to the class systems of previous Battlefield games. The player can choose between Assault, Medic, Engineer, and Recon. The Assault class is armed with an assault rifle and an “Ammo Box,” which can be used to resupply the player and teammates with more ammunition. Medics have a light machine gun and are able to heal themselves and other players with a “Medic Box” as well as being able to revive other players with a defibrillator. Engineer class soldiers are equipped with an RPG-7, a submachine gun, and a repair tool that can be used to fix teammates’ vehicles. Lastly, the Recon class utilizes a sniper rifle, motion sensor, and M18 Claymore mines. The four classes also have the ability to wield a shotgun and a tracer dart gun, which is not class-specific. This class system has been used in Battlefield: Bad Company 2.